Coming into their Thursday night match against the Charlottetown Islanders, Sherbrooke had a four game win streak behind them. After a heavy day of travel were overwhelmed by the home team. Sherbrooke in their first game of a three game road trip was heavily out shot and despite Evan Fitzpatrick‘s best effort in net lost to the Islanders by a final score of 5-3. By the end of the first 20 minutes Sherbrooke had been out shot by a margin of 19-4, after 40 minutes that gap grew to 44-14. 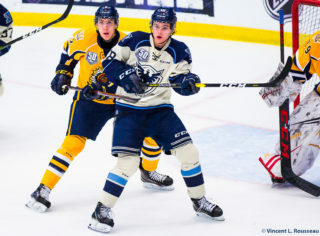 Even with the heavy workload Fitzpatrick, kept Sherbrooke in the game as the score was only 3-1 entering the third period. Carl Neill tied the game with a power play goal goal early in the second period to make it one-a-piece at the Eastlink Centre, assisted by Julien Pelletier and Thomas Grégoire. The Islanders scored the next two goals though with goals from Will Thompson and Filip Chlapik. 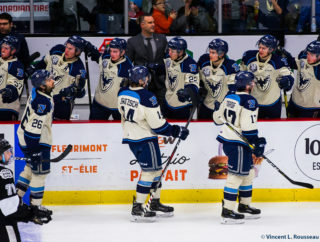 The momentum moved back in Sherbrooke’s direction after Pelletier opened the third period with a power play goal 50 seconds into the third, assisted by Hugo Roy and Grégoire, bringing the deficit to a single goal. The Islanders answered right back again though, with two straight goals from Chris Chaddock and Kieth Geston. 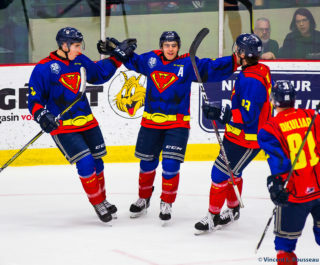 With less than two minutes to go Hugo Roy scored his tenth goal of the season to finish to the game as the Birds’ four game win streak was snapped their first match of the three game swing in Atlantic Canada. 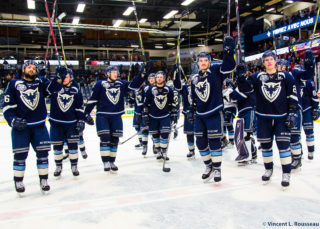 Sherbrooke plays the Halifax Mooseheads tomorrow in the second of three games in three days. Be sure to follow the team on facebook to see more photos from the team’s adventure into the Maritimes over the weekend.